Reid: "Lieberman is an important vote for this caucus"
The "independent Democrat" from Connecticut gets a talking-to from Obama, but his Senate position looks safe for now, despite his active support of McCain. Joe Lieberman's been getting an earful lately. The senator from Connecticut, who styles himself an "independent Democrat," has been actively supporting presumptive Republican nominee John McCain, and for the most part has been able to get away with it. But now that Barack Obama appears to have captured his party's nomination, Lieberman has been taking some heat. For the moment, though, it looks as if he's pressing on as before. Obama and Lieberman greeted each [other] on the Senate floor in the Well as they were voting on the budget resolution. They shook hands. But Obama didn't let go, leading Lieberman -- cordially -- by the hand across the room into a corner on the Democratic side, where Democratic sources tell ABC News he delivered some tough words for the junior senator from Connecticut, who had just minutes before hammered Obama's speech before the pro-Israel group AIPAC in a conference call arranged by the McCain campaign ... The conversation was a stern rebuke to Lieberman for his criticism of the presumptive Democratic presidential nominee on the conference call, as well as a discussion about how far Lieberman is willing to go in his advocacy of McCain, and the tone of the campaign. A colleague pointed out to me that Obama's actions during the conversation -- according to Roll Call, "Obama literally backed up Lieberman against the wall, leaned in very close at times, and appeared to be trying to dominate the conversation" -- recalled some famous images of the way former President Lyndon Baines Johnson, the "Master of the Senate," had leaned into opponents when pressing a point. 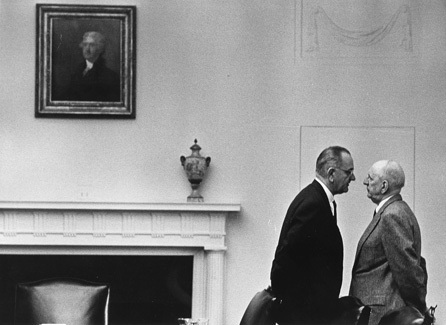 A photo of one such instance, showing LBJ and Sen. Richard Russell in the White House less than a month after LBJ was sworn in as president, is below. Senate Majority Leader Harry Reid also spoke with Lieberman on Wednesday. In his public statements about their conversation, Reid was diplomatic. "I think the discussions he had with Obama yesterday and the discussions he had with me yesterday were fruitful. We'll let the future decide what it's going to be, but I'm not about to threaten anybody," he told reporters on Thursday, going on to defend Lieberman and his role in the Democratic caucus in the Senate on issues unrelated to the campaign and to foreign policy, like the budget. "I think everybody should understand that Joe Lieberman has made a decision on issues relating to the war. And he's decided to back John McCain. But Joe Lieberman is an important vote for this caucus." Citizens for McCain is an organization within the McCain campaign for people who put country before political party and support the candidate for President who has a proven record of bipartisanship. As you know, I caucus with the Democrats as a United States Senator and was the Democrat Party's nominee for Vice-President of the United States against President Bush and Vice President Cheney. But first and foremost, I am an American. I have an obligation to do what I think is best for our nation regardless of political party. My love for this country and strong belief in John McCain's character, judgment, and willingness to work with leaders of both parties has convinced me to support him for President. In the e-mail, Lieberman also specifically refers to supporters of Hillary Clinton and seems to tailor some of his pitch their way, writing, "The phones at the campaign headquarters have been ringing with disaffected Democrats calling to say they believe Senator McCain has the experience, judgment, and bipartisanship necessary to lead our country in these difficult times. Many of these supporters are former supporters of Senator Clinton." Lieberman also referred to what he said was McCain's "very good working relationship" with Clinton and quoted some of McCain's words praising Clinton, part of the speech the Arizona senator gave Tuesday night.